As I sat eating my salad for lunch today (the same salad I eat most days for lunch), I came to a conclusion regarding food, recipes, healthy eating and cooking in general. Simple is usually better for me and my family. I am always trying new recipes, running to the store for special ingredients, slaving in the kitchen, and making a mess for little more than a look of "this is okay" to maybe a "this is good". It is not that they don't appreciate my effort (okay, maybe the girls don't really understand), but most dishes are just not earth shattering and probably won't be made again. What my family does enjoy and actually comments on usually ends up being the simple recipes with fresh ingredients and great natural flavors. I guess I shouldn't complain, makes my life easier. So, of course I want to share some of our simple family favorites with you. Breakfast: I have to qualify this as my favorite breakfast food. I eat it almost every morning and would choose it over a big greasy breakfast at the local coney island anyday. Snack: Snacking can be dangerous for a lot of people. 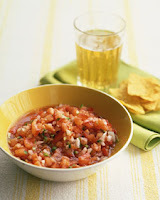 No matter what time of day you are rummaging around in the cupboards, fresh salsa and my favorite torilla chips are always a great option. Stir ingredients together. Refridgerate for 1 hour before serving to let the flavors develop. My favorite chips: Trader Joe's Veggie & Flaxseed Tortilla Chips - mmmm good. Main Dish: I am very lucky, I know, that my 5-year-olds love salmon. We eat it regularly and this is a truely simple, delicious and easy recipe. Heat broiler. Place the salmon and tomatoes, cut-side up. in a broilerproof roasting pan or on a rimmed baking sheet. Sprinkle salmon with paprika. 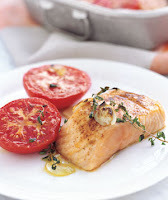 Drizzle the salmon and tomatoes with the oil and season with 3/4 teaspoon salt and 1/4 teaspoon pepper. Scatter the thyme and garlic over the top. Broil until salmon is opaque throughout and the tomatoes are tender, 8 to 10 minutes. Side Dish: Kids love fries, actually we all love fries, but these are definitely healthier and taste great. They go with everything and add tons of color and flavor to every meal. Put ingredients in ziploc bag and toss to coat. Cook for 20 - 25 minutes, turning about halfway through. Fries are done when thar are browned around the edges. Transfer immediately to a paper towel lined plate and serve warm. Alternative - just toss in olive oil and some seasoning salt. We love them that way too! Treat: I gave up refined sugar a little over two weeks ago so there are not cookies or ice cream treats on my menu. Instead I have been eating what described to me as 'nature's candy' by my Raw friend Kristen. They are suprisingly sweet and satisfying. Just buy a package of whole pitted dates and eat 2-3 after your meal if you are feeling the need for a sweet treat. Dates are full of antioxidants and have zero fat. I hope you will find some of our family favorites as simple, delicious and nutritious as we do! I would move to the USA for the salmon alone! Over here, only the upmarket supermarkets stock it and it's so expensive I've never bought it... and I love myself some fresh salmon! I also love oatmeal for breakfast - it's a great way to start the day. Time to try the sweet potato fries... I've been doing it with potato and beetroot, but not with sweet potato. And thanks for reminding me that I had some left-over salad in the fridge. That was lunch and it was delicious! So funny, we just bought those Trader Joe's chips yesterday!! And I am personally going to try the dates.